TAPIT EX is an easy-to-use business productivity and management tool. TAPIT EX Call Accounting software works with any telephone system that provides SMDR/CDR (Call Detail Record) information, helping you make valuable use of data already available to you through your phone equipment. TAPIT EX stores the call record information generated by your phone system, and lets you recall it in your choice of report formats, providing you with important information to help you better manage your business. Many Reports To Choose From. 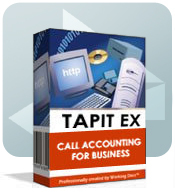 TAPIT EX Call Accounting software lets you choose from a variety of reports to assist you in managing your business more effectively. TAPIT EX menus give you the flexibility of selecting criteria for each report to provide the specific information you need. TAPIT EX produces reports on demand or on an automated schedule determined by you. All reports can be viewed on your computer’s screen, printed, saved to your hard drive, e-mailed or viewed on the Web. The Remote Site Polling Module for TAPIT EX. Businesses with two or more locations can count on the Remote Manager to help them realize the greatest benefit from TAPIT EX Call Accounting. The TAPIT EX remote site polling module allows you to monitor call activity automatically up to 100 remote locations, even when those locations use different phone equipment! With the Remote Manager and TAPIT EX, your host computer automatically polls remote offices’ SMDR/CDR data, allowing you to access exactly the information you want from each site. In addition, the TAPIT EX remote polling feature allows you to schedule the call at a time you choose, letting you retrieve information when offices are closed and long distance rates are the lowest. Remote Manager enables you to view a consolidated report for the enterprise, or an individual report for each site. TALITY Call Accounting is specifically designed for the service industry, allowing businesses to generate additional revenue and to monitor phone activity. TALITY is the call accounting software of choice for the hospitality industry, colleges and universities, marinas, call centers, shared tenant offices, school systems, country clubs, camps, and more. TALITY is fully Microsoft Windows compatible and easy to use. TALITY interfaces with all PMS (Property Management Systems) on the market today, providing an easy check-in and check-out feature. TALITY captures your SMDR data, prices the call as instructed by you, reformats the priced call information and exports it to your PMS system automatically. The program offers flexible costing and surcharging facility. If you’re wondering what call accounting can do for your business, consider this: for most businesses, telephone costs are the largest expense after payroll. What’s more, 22% of the average business’ phone calls are non-business related, resulting in lost productivity, lost revenue, and higher business telephone expense. identify fraudulent use . . . and more. Professional firms and other businesses count on call accounting to allocate the costs of calls to particular projects, personal accounts, or to generate a record of billable hours spent on the phone. Trisys’ Call Accounting software lets you choose exactly the information you need and delivers it to you in the most desired format.